What’s the difference between a UNO fitter and a NORD fitter? confusing. We use the term “Uno” for domestic-socket fixtures, and “Nord” to describe fixtures fitting the European-style sockets. Uno rings fit standard domestic metal sockets. They are 1-1/4” ID and slip or screw onto the end of the socket. Unos come in two types, threaded and slip-on. 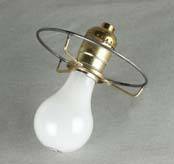 Threaded unos are used on bridge lamps and some swags, where the edge of the socket is threaded. They are only used in the top of a shade, with very rare exceptions. We stock threaded uno tops in diameters 4" through 8". Standard recess is 1/2", and most sizes are also available with a 2” recess to hide the lamp socket when the shade is installed. Slip-on unos are used instead of a clip, to get a more rigid and straight connection to the lamp on small shades, where the shade isn't tall enough for a harp. Slip-on unos are not threaded, and come down from the top of the shade 4" to 4-1/2". Euro Nord fixtures are for European style sockets, where the entire outside of the socket is coarsely threaded. This system uses a “shade ring”, that screws onto the socket, clamping down on the shade’s Nord fixture. Nord fixtures are typically 1-5/8” ID, but there are other Nord socket sizes used in the US, including 1-1/8” mini-Nords. Use of Nord fixtures has increased quite a bit in the last year, because of imported lampshades, however it is not easy to find a source in America for the Nord fitter rings. These may be used in either the top or the bottom of the shade. For example, they can go in the top of a pendant shade, or in the bottom of a shade used on a sconce or table lamp.